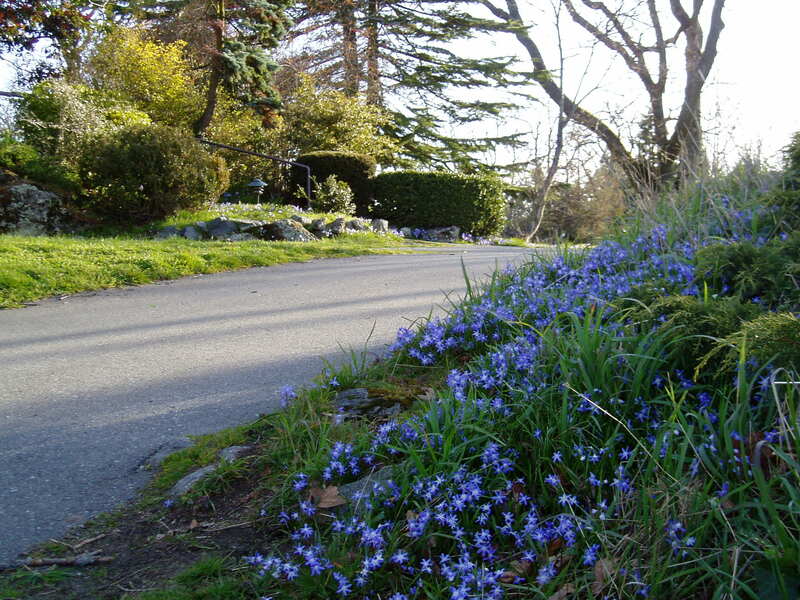 In March a couple of years ago I started noticing patches of tiny blue flowers along the roads of older neighborhoods. 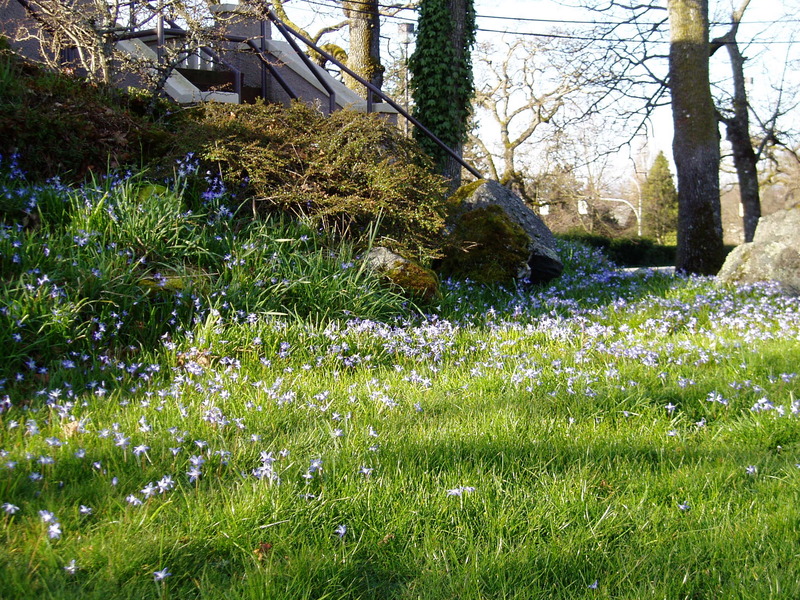 Here were flowers flourishing in areas that hadn’t been manicured for a very long time. I soon realized these blooming meadows are the naturalized dreams of gardeners past. I’m charmed by that romance. Glory of Snow originated in Turkey & Greece – along the Mediterranean. I’ve heard southern Vancouver Island compared to a Mediterranean rain forest, so it makes sense these plants survive well here. What surprises me more is that they’re hardy to zone 4! They can withstand a whole lot more cold. Do these grow in your neck of the woods?? Once planted, just leave them to their own devices. How great is that? 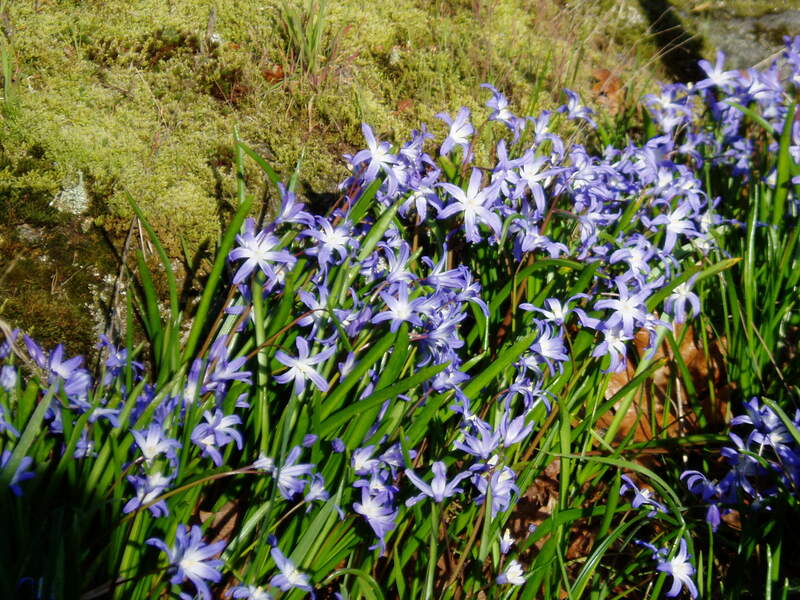 I’ve even seen them surviving in shallow crevices of rocky outcroppings. They seem perfectly happy in lawns, too, although I’ll bet they do better if the grass isn’t cut until late April when they’re done for the season. That would mean it’s more of a meadow than a lawn. C wouldn’t go for that. He likes lush, but trim. That’s why I’ve added Glory of Snow as under-story plantings in our shrub border instead. The best patch I’ve ever come across is around Dunlop House Restaurant, a heritage building on the grounds of Camosun College, and facility of the Hospitality Management Program. C’s mum took us there for supper the other night. The meal was lovely, and the meadow: spectacular! Hi, thanks for visiting! I'm Susie, a professional writer & gardening fanatic. New? If you like what you see, enter your email address below to subscribe to this this blog & receive new posts by email. Looking for something specific on this site? © SVSeekins, 2011 through current year. Unauthorized use and/or duplication of this material without express and written permission from this blog’s author and/or owner is strictly prohibited. Excerpts and links may be used, provided that full and clear credit is given to SVSeekins with appropriate and specific direction to the original content.